FOR A man who two years ago was reputedly the highest paid rugby player in the world, Sebastien Chabal embarked upon the latest stage of his career at the weekend with less fanfare than he’s been used to in the past few years. The 34-year-old No 8, once of Sale Sharks and Racing Metro, made his debut for Lyon in the French second division. Just over 5,000 fans turned up to watch Chabal help his new club kick off their 2012-23 league campaign with a 30-12 defeat of Tarbes. The beard hasn’t changed and nor has the hair, though it’s now flecked with grey, and the big man is even more one-paced than before. Indeed Chabal has never had the skills to be a top-class No 8 but that’s not held him back during his club career. Back in 2010 Chabal was reportedly raking in €1m a year, more than Jonny Wilkinson, Dan Carter, Brian O’Driscoll or any other world-class player whose talent dwarfed that of the man they call ‘Caveman’. Many years from now a rugby historian will chronicle the evolution of the game in the early 21st Century and wonder how it was that Chabal fooled so many people for so long. And their conclusion? It was all about a beard. For the first five years of his Test career he was a clean-shaven and inconspicuous forward, winning the bulk of his caps from the bench. True, he’d put in some good hits from time to time but he lived in the shadow of those great French forwards Fabien Pelous, Imanol Harinordoquy and Raphael Ibanez. 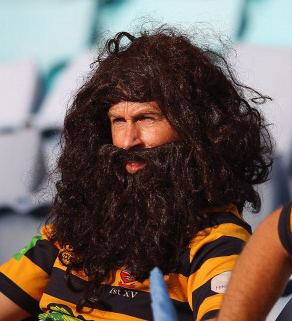 Chabal’s decision to go Neanderthal proved astute as well as hirsute. French organisers needed a ‘face’ to help promote the 2007 World Cup in a country that – in the north, at least – was proving indifferent to the tournament. Chabal’s caveman look fitted the bill. It appealed to Frenchwomen and men, particularly those sophisticated types working for Parisian marketing and media companies. 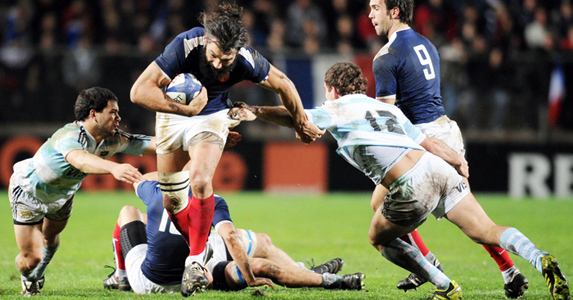 Chabal conformed to their stereotypical image of rugby far more than the metrosexuality of the gifted Frederic Michalak. Within the space of two years Chabal was the highest paid player in rugby and one of the richest sportsmen in France. And then it all started to go wrong – thanks in no small part to the English. They had him sussed long ago, having seen his limitations at Sale, and these were ruthlessly exploited in the 2009 Six Nations. Chabal was selected to play at openside against England, an astonishing decision even by Marc Lievremont’s dizzying selections standards. In the first minute England centre Riki Flutey exposed Chabal’s leaden pace to put in Mark Cueto for the opening try and later Flutey stripped Chabal of the ball to spark a move that ended in a try for Delon Armitage. England won 34-10 and even French men and women who didn’t really know their rugby could see the Caveman’s roar was on the wane. The following season Chabal lost his place in the starting line-up (and France won the Grand Slam) and in 2011 he was axed altogether from Les Bleus following their defeat to Italy in Rome. In May the same year he was banned for 60 days for publicly criticising the standard of refereeing in France, and in February this year he was released “with immediate effect” from Racing Metro after an alleged dispute with coach Pierre Berbizier. But we live in an age where image is as important as talent, and Lyon stepped into the breach, offering Chabal a two-year contract. “The officials at Lyon approached me when I left Racing in February,” he said, by way of explaining his step down to the second division. “I was even thinking of retirement but I wanted to have another go.” Perhaps the reported salary of €250,000 a year also influenced Chabal’s decision. 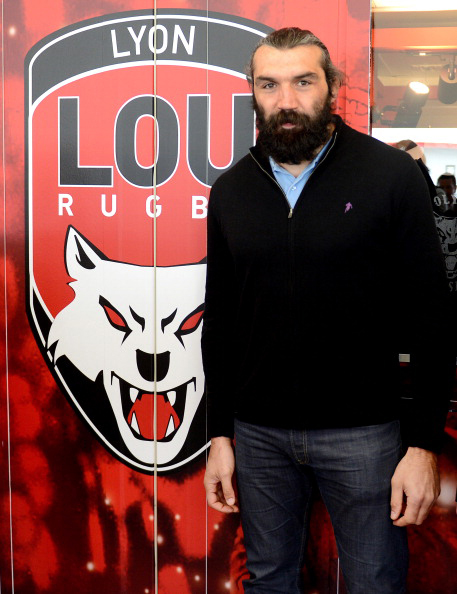 Chabal’s coach at Lyon is the former Scotland and Lions prop Tom Smith. Now there’s irony for you. Smith was one of the most underrated players of his generation, a man who never thrust himself into the limelight but one who went about his work with a quiet efficiency and fierce determination. And he did it all without a beard.